Our house officially went on the market this week. That means a lot of my time has been spent tidying before making myself scarce for photos, an open house, and random showings. The experience unfortunately brings out the perfectionist in me, which makes it very stressful. This past Saturday evening, I swept the ceiling in the garage. Let’s pause and allow that to sink in for a moment: I swept the ceiling in the garage. That was before I received feedback that sent me on a late night drive to the hardware store in the rain. I needed to repair some silly item someone noticed but nobody in real life would ever actually give a second thought. Perhaps it comes as no surprise, then, that I haven’t spent a lot of time making anything in recent days — unless you count prepackaged baked goods so the house will smell divine at any given moment. On a brighter note, while I’ve been required to stay away from home I’ve spent some time using up local gift certificates and rewards. I was a bit disappointed to learn that I need to spend $200 before I earn my next $25 reward at my favorite local yarn shop — that’s not in the budget! But the yarn shop is not far from the local art supply store. 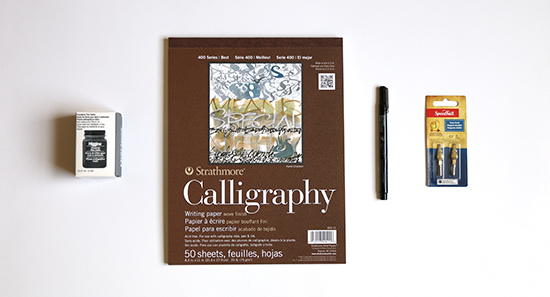 You might recall that I read a book about hand lettering in the fall and needed some supplies before getting started. I finally picked up those supplies. The paper, ink and brush pen are all a little different from what Ivan Castro recommends in “The ABC of Custom Lettering.” I did the best I could with what was available, and I think it will be a good enough start for when we’re settled again. I have managed to knit some more of the entrelac scarf that I posted about recently, although not enough to warrant a photo of the latest progress. I have probably a little over a half skein of yarn left to knit, so I should have a “ta-da” post soon — if I can step away from the cleaning supplies. What is the craziest thing you’ve found yourself cleaning while under pressure?